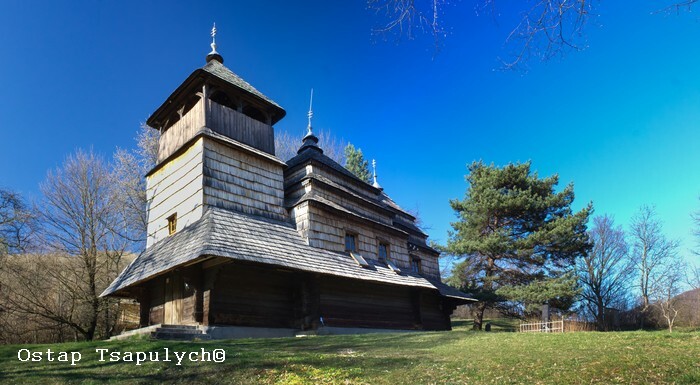 According to the researchers, the church was built in 1645 in the village of Syanky as a classic Boyko style church – frame-built, three-dome (with a dominant central dome) but in 1703 it was moved to Kostryno. This Kostryno church is one of the finest monuments of Ukrainian architecture and its beauty lies in the magic of proportions, size of the church, as well as in the lines of its silhouette. From any angle it looks like an exceptional work of art, which fits in perfectly with an extraordinarily beautiful landscape. A bell tower was built over, and thus the church looks even more dynamic due to its forms growing from East to West, which makes it look like a more lemko style church. « CHURCH OF ST.BASIL THE GREAT. 1703, VILLAGE OF SIL.